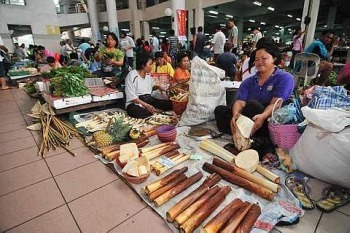 THE Sibu Central Market (SCM) can be best described as the top tourist spot in town. If you have not visited SCM, you have not visited Sibu. This is not an exaggeration considering the fact that there are 1,100 hawker stalls in the market on week days and an additional 400 to 500 stalls on weekends when Ibans and Orang Ulus (minority people from the interior) jam the tamu (open-air market) section of SCM with their exotic jungle food and fruits. Certainly the largest and best-managed market in Sarawak, SCM is vying for the title of Largest Market In Malaysia in the Malaysia Book of Records. 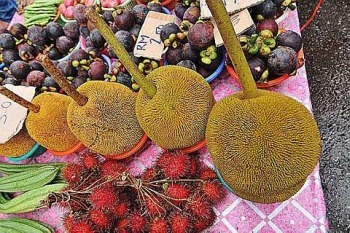 Special: The tarap fruit (centre) is native to Borneo. Data on SCM has been compiled and sent for bidding by the Sibu Municipal Council (SMC). Hawkers in Sibu were creating social and environmental problems before they were resettled in SCM in 1996. They were scattered all over the waterfront, in back lanes and alleys, on five-foot ways and residential areas where many traded illegally from their homes. 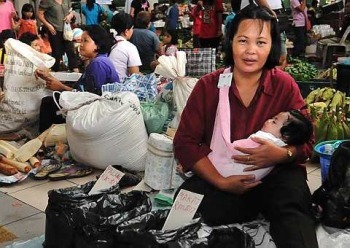 The opportunity to solve these woes came when one of the markets, which looked like a shanty town on Lembangan River in the town centre, was destroyed in a fire in 1990. A teenage boy was killed. SMC grabbed the opportunity to clear the area and proposed a modern double-storey market in its place. Construction of the RM13.5mil market started in 1994 and was completed two years later. The task of resettling the hawkers begun almost immediately. Several smaller and run-down markets in the town were demolished so that all the hawkers could trade under one roof at SCM. The new market was divided into sections according to the goods sold by the hawkers. The main sections are the wet and dry areas where hawkers sell fish and other seafood, slaughtered chickens and ducks, bean curd and bean sprout. At the dry section they sell all kinds of local and imported vegetables, fruits, dried fish and prawns, spices, handicraft, flowers and ornamental plants, sundry goods, drinks, homemade cakes, buns, titbits and other confectionery. Hawkers selling live chickens and ducks at the dry section attract the most attention from tourists. It is the way they bundle the feathery creatures that make them popular and famous. Each bird is wrapped in newspaper, tied with nylon strings and displayed in neat lines for customers to choose from. Several local and foreign radio and TV stations have reported on this unique way of selling chickens and ducks. The pork section is separated by an aluminium partition. Variety: Wild palm shoots on sale at the tamu. Evert weekend, SCM is overcrowded when the temporary stalls are set up to form the colourful and noisy tamu. It is set up on Saturday afternoon and closes at noon the following day. The natives display for a rainbow parade of jungle and farm products on the floor or low makeshift tables. Visitors are mesmerised by the activities of the natives, the majority of whom are Ibans from longhouses in Sibu and surrounding districts. 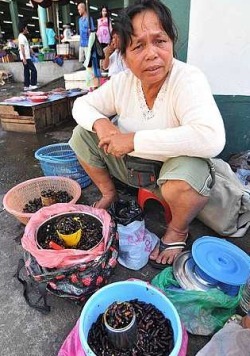 Among the unusual stuff sold are live sago worms, frogs, kasam (preserved fish, pork or venison), fried insect larvae, wild jungle ferns, young palm shoots and wild fruits. One will feel the overwhelming hospitality that Sarawakian natives are justifiably famous for. Everyone is friendly and helpful, and if you ask for permission, they will certainly let you take photographs with them and even allow you to taste some of the exotic fruits. Many local and foreign visitors have made the acquaintance with these natives during their visits to the tamu. SCM’s upper floor is occupied by food and drink stalls and also stalls that sell fashion and tailor-made items and shoes. The food and drink stalls are no less attractive, with many of them offering the best kampua (Foochow noodle) Chou Chai Hung Kan (rice vermicelli) Kong Bian (Foochow bagel) Yew Hu Eng Chai (squid with tou fu and kang kong), Wu Wei Tang (five-herbs drink) and Chia Luk (a concoction of jelly, red beans, sago pearls and coconut milk) to name just a few. Prices are competitive here because of the lower rent. SMC has direct jurisdiction over the market under the Local Authority Ordinances and Local Council bylaws. The market is managed by the Market and Petty Traders Committee headed by an experienced councillor. The council issues hawker licences and provides security, cleaning and garbage-disposal services. An adjacent multi-storey car park built by SMC provides shoppers peace of mind as far as their cars are concerned when they shop or dine at SCM.